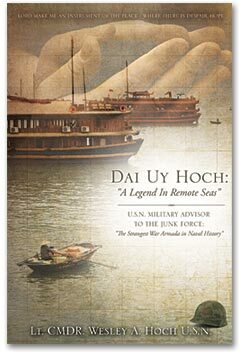 Within the pages of Dai Uy Hoch: A Legend in Remote Seas, the late Lt. Cmdr. Wesley A. Hoch, U.S.N., recounts his unique mission on the island of Phu Quoc, Viet Nam, where he was appointed by the U.S. Navy to advise the Vietnamese “junk force” in what seemed to be a hopeless situation. Known to the local Vietnamese as Dai Uy Hoch—a title for “chief” or “leader,” which was a sign of respect—the author was able to use his strong Christian faith to complete his assignment and become a national hero both at home and in Viet Nam. This detailed narrative will give readers an example of the result of one prayer—the Prayer of St. Francis of Assisi—and the effect it had on one man in a deplorable and dangerous situation. Copyright © 2019 Lt. CMDR Wesley A. Hoch U.S.N.